These days, the mark of a band’s arrival on the scene is often its connection through a pop culture outlet. Mountain reggae by the Codi Jordan Band has hit two major strides, with its song “Shake Shugar Shake” on the Canadian teen drama “Degrassi” and by being selected to play in Eddie Bauer stores’ “Artists to Watch” series across North America. Bass player Cameron Goldsberry said such exposure is important to stand out in a crowd of talent. “Social media has been a great tool to get the music out to people that otherwise might not have a chance to hear the music,” he said. Hear the band, with Goldsberry, Codi Jordan on vocals and guitar, and Jonny Knoder on drums, live at Whiskey Jacques’ in Ketchum on Friday, Feb. 8, at 9 p.m. for $5. 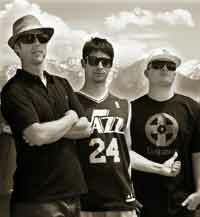 The Codi Jordan Band is a reggae rock band in the vein of popular acts Sublime, The Dirty Heads and Slightly Stoopid. Hailing from the greater Salt Lake City area, the band has toured relentlessly across the West, spreading its homegrown mountain-town sound across 12 states and hundreds of stages. Front man Jordan grew up in the small ski town of Eden, Utah. Both his parents grew up in Southern California but opted to move to Utah in search of mountains and snow. For Jordan, having family in Southern California led to a fascination and love for the Southern California lifestyle, the ocean and the budding reggae/rock/surf/punk scene. Jordan began writing lyrics and composing music at age 12; a few years later, he was introduced to the recording studio by a local hip-hop artist who noticed him playing and singing at a local house party. The “Vacation” CD came out in 2008 and was voted local album of the year by Weber State University’s local radio station. “Positivity” followed in 2011. The band has shared the stage with Dashboard Confessional, The Dirty Heads, The Neon Trees, The Expendables, Trevor Hall and Tomorrows Bad Seeds. David Baty, acoustic reggae from Denver, will open for the band.